Samsung has started pushing android 4.3 firmware for Galaxy S4 GT-I9500 users as well, starting with Russia. Official android 4.3 firmware is released in Russia and it’ll soon be released in other countries over upcoming weeks. If you don’t want to wait that longer, you can flash your I9500 exynos version of Galaxy S4 with the Russian firmware, without voiding warranty as this is official stock Samsung firmware update. Reading mode for optimizing display when using specific apps for reading purposes. To enable reading mode for particular app, you need to go to its settings and select the apps for which you want to enable it. You can go to its setting by pressing and holding its toggle button from the status navigation bar. WiFi network speed and quality test enabled by default and switches to mobile network when the result is negative. 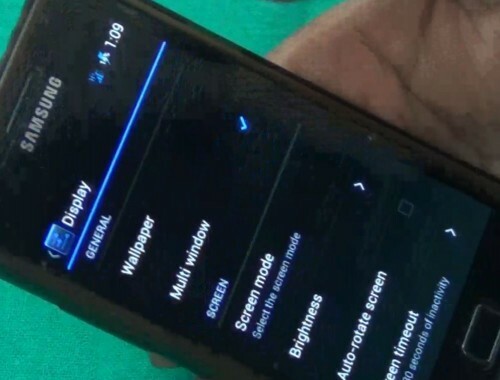 You’ve to disable auto network switch advanced setting in WiFi to force your phone to remain on WiFi. Spiral view option in Gallery app. Storage tab in task manager shows accurate available internal storage. Battery backup – To BE UPDATED (it’s still early to comment on this). Improved Sound (as per my opinion). After installing this, your device status will go back to official if you’re on custom. Recovery will revert back to stock if you’re on custom recovery-ies like CWM or TWRP. Your phone will be unrooted if it was rooted. Overall speed, gaming, other benefits – to be updated after thorough review. Keep checking our site for more updates. Watch the embedded video in this post for visual demo of new features and flashing guide. Download ODIN program from here. Download Official Android 4.3 stock firmware for I9500 from here. The download link given here supports resume (not hotfile link) so you can use download manager to download it, pause and resume as per your internet connectivity. Just go to the link and choose free and then proceed with the download. Extract the downloaded GT-I9500_SER_I9500XXUEMJ5_I9500SEREMJ5_I9500XXUEMJ5.zip file. Plug your phone to computer via usb data cable. Launch ODIN program. ODIN will detect your phone and show blue colored box in its window, or added message in its log section window. Click on PDA button and browse to the extracted firmware file and then select I9500XXUEMJ5_I9500SEREMJ5_I9500XXUEMJ5_HOME.tar.md5 file. Now click on Start button. It will take time so have patience. Once ODIN displays PASS message in Green colored box, you can unplug the phone from computer. Your phone will be automatically rebooted. You’ll see android is upgrading, optimizing, installing apps message on the first boot. Done! GO to settings and about phone and check your android version. Feel free to ask your doubts/queries in comments section. If the firmware becomes available for your country in upcoming weeks and you’ve already flashed this Russian firmware, you need not worry. You can flash your country’s firmware as well by using the same steps as mentioned above.